Tom Hardy conveys menace with the ease of Jimmy Fallon conveying love to any and all of his late night guests. So that’s certainly not the problem with FX’s explicitly profane Taboo, a BBC One co-production that has its U.S. premiere just three nights after launching abroad. For an intended eight-episode limited series, it tends to be exceedingly slow-paced in the first three hours made available for review. Dark secrets and past treacheries lurk and abound, but getting around to them might require more patience than many viewers are willing to expend. Still, there remains something of an abiding interest in what might happen and what did happen to James Delaney (Hardy), a blunt-spoken, uncompromising, presumed dead prodigal son whose very unexpected return to dank 1814 London sets events in motion while also tending to plod in place. Not everything has to move at breakneck speed. But Taboo at times can feel like a tedious rush hour commute. Or to put it another way, it’s the frenetic, Hardy-starring Mad Max: Fury Road on a grease rack. As Delaney, he returns from Africa after a mysterious 10-year absence to gaze upon a just-deceased father who seems to have been thoroughly despised by one and all. “Forgive me, father. For I have sinned indeed,” Delaney tells him over his corpse. Horace Delaney’s will has left his only son with a small but coveted strip of land known as Nootka Sound. The nefarious East Indian Company, chaired by a cutthroat named Stuart Strange (fine work as usual from Jonathan Pryce) very much wants to buy him out. But Delaney emphatically resists all offers while his half-sister, Zilpha Geary (Oona Chaplin), resists his entreaties. Clearly they had something taboo going on years earlier. But Zilpha now is married to Thorne Geary (Jefferson Hall), who wants Delaney dead, as do a lot of other people. Machinations and manipulations proceed, but definitely in no big hurry. The 1814 London depicted in Taboo is convincingly dark and grimy, which suits Delaney’s disposition, even if he rides a clashing white horse. His only confidante in the early going is an older guy named Brace (David Hayman), who doesn’t have much luck in trying to temper his extremes. “I’ve made some coffee. It’ll be stone cold,” Brace tells Delaney in Episode 2. “Aren’t we all,” he replies. Targeted by would-be assassins -- who seem to have little sense of urgency -- Delaney also is tormented by occasional visions of his traumatic times away from London. We learn he was held captive on a slave ship that sunk. But how and why he got there, and what the amoral Stuart Strange had to do with it, remain very much an open question after the first three hours. As an actor, Hardy clearly is in his primal element. He’s constantly on-screen, moving about town and snarling his contempt for those he doesn’t like -- which is pretty much everyone. Episode 2 introduces another adversary, but no need to ruin what this could mean to him and his revenge-taking plans. This person’s arrival provides a bit of a jolt, but Taboo seems little inclined to seize the momentum. Three episodes deep, there’s an appetite for more, but not a ravenous one. 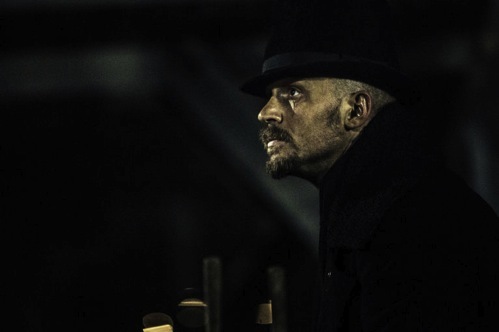 Taboo could develop into a whale of a tale once Delaney is fully seen in his earlier element. The official trailer shows him in an all but naked previous tribal mode, brandishing a spear with a knife attached to his loincloth. It stirs the juices, even if the broth too often congeals in these first three hours. “I do know the evil that you do, because I was once part of it,” Delaney assures Strange in the early going. Good to know. But now let’s get on with it.